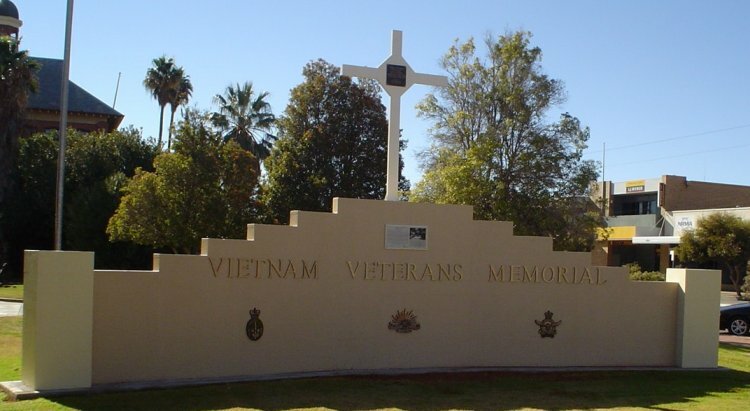 On the 18th of August 2004 the Vietnam Veterans Club of Broken Hill opened their Vietnam Veterans Memorial. Two Hueys from 171 Squadron come from Oakey with eight crew members to do a fly past. One of the Hueys had served in Vietnam. This wide shot of the Broken Hll Vietnam Veterans Memorial shows that it is surmounted with a replica of the Long Tan Cross, with a plaque underneath explaining the story of Long Tan. The emblems of the Royal Australian Navy, the Army and the Royal Australian Air Force pay tribute to the Services. Future planning includes the fitting of two further plaques to tell the story of the Vietnam War and those who served. The Catafalque Party for the opening was from the 10/27 Battalion of The Royal South Australian Regiment (RSAR) using the 7.62mm L1A1 Self Loading Rifle (SLR) as used during the Vietnam era rather than the 5.56mm Steyer. The money to build the memorial was raised locally to meet the cost of about $8,000. The Broken Hill Vietnam Veterans also raised a fund that will look after the wall forever. The fund will be handed over to and managed by the Broken Hill Council when the veterans feel that they are too old to look after it themselves. Des Kennedy started the Broken Hill Vietnam Veterans Club in 1999 with John Amos, together with their wives Olga Kennedy and Liz Amos. John designed the memorial. Both men served with the First Battalion of the Royal Australian Regiment on the second tour in 1968/1969. 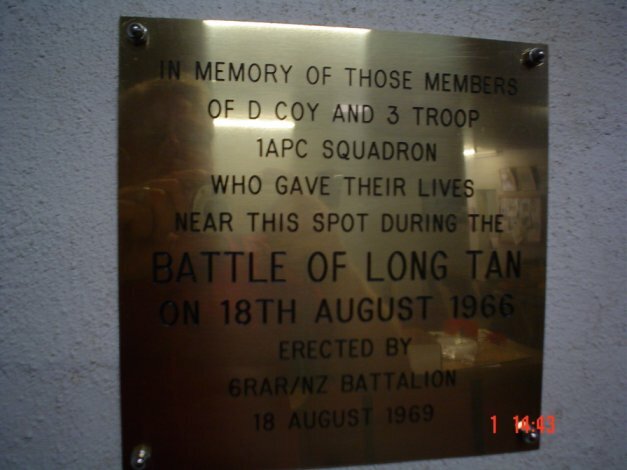 The pictures below show the detail of the replica Long Tan Plaque and the Iriquois Helicopters which took part in the dedication ceremony.